Anyone who has read The Magical Buffet for a while knows that I love food and drink. When the opportunity presents itself to review a book that could potentially give me ideas of new things to eat or drink, I always go for it. And that is why I was thrilled that Llewellyn Worldwide sent me a copy of “Tea Leaf Reading for Beginners: Your Fortune in a Tea Cup” by Caroline Dow for me to take a look at. There are a lot of books out there about tea leaf reading. For instance I own a copy of the second printing of “Tea Leaf Reading” by William W. Hewitt that Llewellyn published in 1992. My discerning teenage eye choose it because of the pretty gypsy woman peering into a tea cup on the cover. “Tea Leaf Reading” is a fine book. Total truth in advertising. Looking to learn about reading tea leaves? Try “Tea Leaf Reading”! However Caroline Dow gives you tea leaf reading and so much more! Yes, “Tea Leaf Reading for Beginners” gives you everything you need to know to start attempting to read tea leaves. Part two of the book is an ample section on interpreting symbols, although Dow also encourages practice and intuition to determine what symbols mean to you personally. And let’s face it, that is the bulk of what most books about tea leaf reading are, a big ol’ glossary of symbols. Let’s take a look back at my “Tea Leaf Reading” book from the 90’s. It is 226 pages long with pages 25 to 205 being a glossary. I’m not complaining, I’m just pointing out what you can expect from most tea leaf reading books. 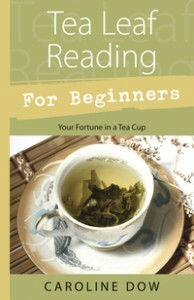 “Tea Leaf Reading for Beginners” is 288 pages long with the glossary of symbols being pages 131 to 246. That leaves 128 pages of other stuff! So what can you find in those other 128 pages? Tons. Of course there are the nuts and bolts of how to set up a reading, but there is also information about different types of tea, cups and saucers, herbal infusions and decoctions, tips for cooking with tea, suggestions for pairing different teas with food, ideas for tea parties and more! The first part of this book is so inspiring! I dare you to not be excited about tea after reading it! Yet what I love best about Dow’s “Tea Leaf Reading for Beginners” is her overall attitude to the practice of reading tea leaves. It’s an event. It’s a magical experience, filled with wonderful stories. I’d say it’s theater, but I fear the jaded among you would then assume it’s a sham. It’s divination with a floor show. It’s a reason to get together with others and enjoy some tea. Caroline Dow’s “Tea Leaf Reading for Beginners” is for those who want to learn to read tea leaves, but also for those who just want to learn to love tea.